Removing an email account is really quite easy. I'll show you how in just a couple of minutes. I have previously shown how to create an email account in cPanel, but what if you want to delete the account you created? This short tutorial will show you how to remove an email account in cPanel. The obvious reason for not needing that mail account anymore. You want to delete all your emails quickly by deleting the account and re-making it. You want to secure an email account for a member of staff who has left the company. You have changed your email address. You want to free up disk space by deleting the account (and all its mails) and remaking it. Back up any important messages to your email client (i.e., Outlook or Mozilla Thunderbird). Remove \ replace your email address from any website, forms, online accounts, etc. Set up a default email address to catch any emails sent to that address. Consider whether to set up an email autoresponder and \ or email forwarding. Finally, log in to cPanel. Once you are logged in to your cPanel account, scroll down to the mail section. Click on the Email Accounts icon to go to the management screen. 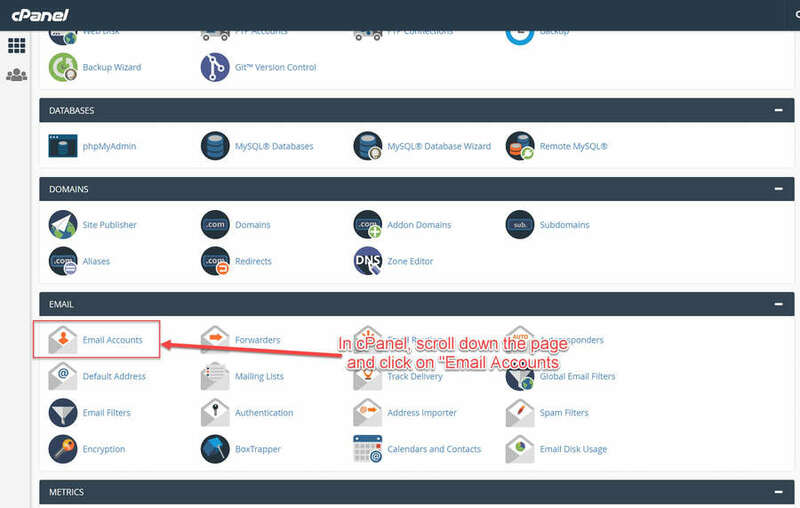 Click on the Email Accounts Icon in the cPanel Dashboard © The Webmaster. For this tutorial, I will remove the testemailaddress@jonathangriffin.me. Scroll down \ locate to find the address you wish to remove © The Webmaster. To the right of your address, under the “Actions” column, you will see several options. Click the “Delete” option to remove it. Click 'Delete' to the right of your chosen email address © The Webmaster. Before cPanel removes your address, you will need to confirm you wish to delete it. Click the “Delete” button to confirm. Confirm you wish to delete 'youremailadress@domain.com' © The Webmaster. Check the address has been removed. You will see that the address is no longer listed, and a “Success” message will temporarily show confirming its deletion. Check confirmation message © The Webmaster. This is a common issue that is caused by “symbolic” links to the mailboxes being left behind. You can avoid this problem by deleting the email account before deleting the addon domain. The easiest solution is to re-add the domain back to the account in cPanel. You can then delete the email account before deleting the domain. You do not need to configure any DNS when doing this. How do I delete multiple cPanel email addresses? There is no easy way to delete multiple cPanel email accounts in cPanel in one go. If you only have a small number I recommend removing them via the cPanel interface. If you have many accounts that you need to remove, and you have root access, it is possible to mass delete your accounts using a script. We have not verified this script, but you may wish to check out this solution on the cPanel forums. Can you delete a default email account in cPanel? The default account refers to your email address account@example.com, where ‘account’ is your account username. You cannot rename, remove, or place a quota on the default account. As such, you should create a custom email address for everyday use. I've tried everything, but still can't remove email accounts from cPanel? It is possible that your hosting provider has inadvertently given your account the wrong permissions. If nothing else works, open a support ticket and ask them to troubleshoot it at their end.